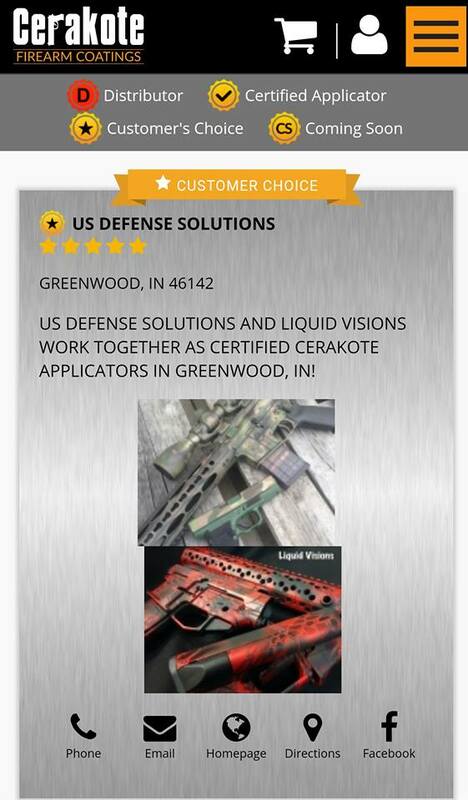 Thank you to our customers who have made us, U.S. Defense Solutions, the #1 Certified Cerakote Applicator AND #1 in Customer Choice for the state of Indiana! We are very grateful to have you as our customers and we will continue to do our best at any firearms sales or service you may have! Well, according to Cerakote's website itself, it is "a Polymer-Ceramic Composite coating that can be applied to metals, plastics, polymers and wood. The unique formulation used for Cerakote ceramic coating enhances a number of physical performance properties including abrasion/wear resistance, corrosion resistance, chemical resistance, impact strength, and hardness." Here at U.S. Defense Solutions we are constantly improving our knowledge and skills in order to provide our customers with the latest and greatest in the firearms world. Cerakote is rapidly becoming more and more popular as the preferred finish for gun coatings. We are proud to announce that it has recently merged with Liquid Visions making USDS a one-stop shop for all of your firearm and Cerakote needs. As certified applicators we are listed on Cerakote's website, and we are grateful to our customers for helping us to receive the Customer's Choice Badge and Top Applicator Rating. You can check out some of our featured designs here. Call us or stop by for a quote!